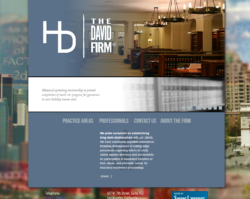 The David Firm® is the boutique law firm of Henry David, Esq. in Los Angeles, California. The David Firm® specializes in commercial litigation and arbitration in the state of California and bankruptcy litigation throughout the United States. Jacoby Alley is currently working with Henry David to produce a new website for him. The current approved desktop model may be viewed here.